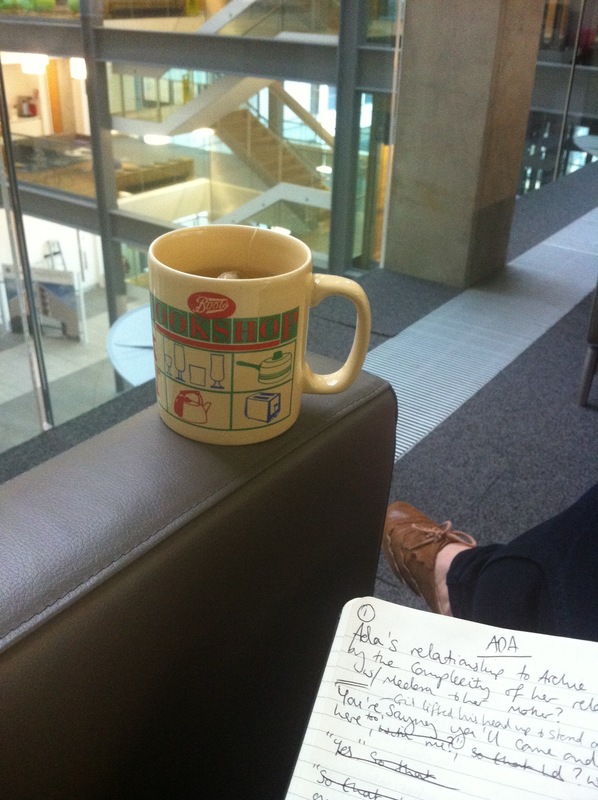 Armed with a cup of tea and my notebook, I spent much of this morning sitting in the mini-Forum on Level two, listening to the dulcet voice of the lift (Going up. Level Three, doors opening) and writing up conversations from the Ada and GIL story. A note here on process: if I don’t know where a story is going, then I pinpoint a moment when two or more characters are having a conversation, let them start talking and see what that reveals. It’s also a way of exploring a scene which can be very clear in my mind, but frustrating to put down on paper. I started forcing myself to do this after i managed to write a 9,000 word story for my undergraduate dissertation which didn’t contain a single line of dialogue, and since then it has become ingrained as a habit. Part of today’s writing was continuing the dialogue i’d sketched out yesterday (between Ada and GIL) and part of it was between Ada and two members of the research team who created the GIL prototype. Thoughts between writing sessions: A majority of the offices viewable from my sofa have at least one pot plant. I wonder if all the foliage is an attempt to block the glass walls and regain a sense of privacy? One man is standing in the middle of his office, throwing a tennis ball up in the air and catching it in one hand. Is he investigating muscle tensions, or is he just bored? Those of you who take the lift from the ground floor to Level One (doors opening), I see you and I judge you for being lazy. Most people using the lift are going to levels four or five, or have multiple bags. When people walk across the floor of the courtyard, they invariably glance up. It might be because they haven’t been in the space before, it might be an instinctive check towards their office or the place they’re headed, or it might be because the space above their head is tall and open and just draws the eye upwards. My vote goes on innate curiosity. There are a lot of desk fans in the offices I can see into. Presumably that’s because I’m looking into the offices with no external windows. Most people are wearing dark colours. When they enter the building through the turnstiles, they tend to be wearing a rucksack and/or shoulder strap bag. When they walk round the building from office to office, they tend to have either a small sheaf of papers or a mug — rarely both at the same time. There is the exception of the Estates man, who walks around with a large stepladder. The sounds in the building are a mixture of aircraft hanger all-over echo, and muted individual sounds such as hard-soled shoes, some kind of air conditioning unit, the soft material-pull noise of the lift and then also the lift’s automated female announcements. There’s the occasional door noise and something going ‘click’ a lot, like a really loud stapler. Sometimes there’s the rush of a kettle. Metallic key noises — people here tend to ‘shake-out’ their bunches of keys as they arrive at/near their offices — perhaps that’s some kind of code. At about 11am the Forum ‘wakes-up’ as a large flow of people come out of a room on the ground floor and disperse upwards, chatting. Most of the offices still look empty though- transparent from all angles. Back to the research at lunchtime- Clare had mocked-up an impressive looking prototype for the title-analyser we’ve been discussing. For the current iteration, you input the abstract of your paper and the citations you’re using, and then set the level of emphasis you want to give certain things (authority of citations used, match to keywords, match to content of abstract) more weight. It then produces a Wordle (type of word cloud based on relative ‘importance’ or words) you can select words from to produce a title for your paper. The tool then produces a variety of titles according to set templates (declarative, descriptive, and interrogative) and analyses each of them according to our criteria of ‘likely to be cited’. My favourite phrase from the meeting todays was that it is ‘better to give people two ways of doing the same thing than expect them to know exactly what they want’. Over lunch, Claire and I had some chat about how different natural language processing analysis techniques could be used for the Writer’s Toolkit I’d like to build over the next year, and then she showed me the best place in town to buy fake blood (Edinburgh Bargain Stores). This afternoon has been spent typing-up this morning’s writing, and trying to decide which book to take back with me on the train- Ada’s biography has been vetoed as too heavy to carry (the book needs to come back to Newcastle tonight, then down to London tomorrow, and back to Newcastle late on Thursday. It will be supplemented by the latest issue of Mslexia). 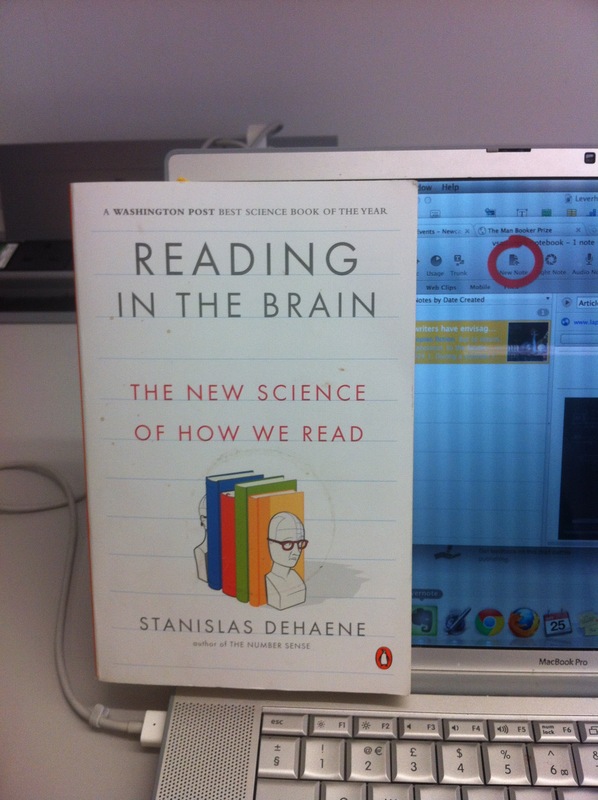 Finally Stanislas Dehaene’s Reading in the Brain: The New Science of How We Read wins out, as it is arguably also relevant to the work i’m doing on memory in Newcastle, and therefore wins me extra reading points. It’s an early finish here today and back to Newcastle for the culmination of One Book 2011- Newcastle University’s collaboration with the Man Booker Prize to get students across the whole campus reading and talking about the same book: Andrea Levy’s The Long Song. 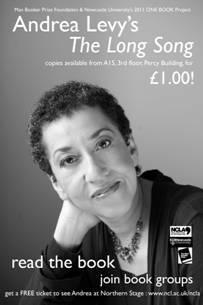 Andrea will be in conversation with Jackie Kay about The Long Song tonight at Northern Stage, so fingers crossed my train isn’t delayed. Andrea looked relieved. ‘Yes. It was just one of those things. A malfunction. Truly unfortunate, but at least –’ she cut herself short.